DARERCA, (Fifth Century), St. Darerca was St. Patrick’s (17th March) sister. She is reputed to have had fifteen sons, ten of whom became bishops. The exact year of her repose is unknown to us. DEOGRATIUS, consecrated Bishop of Carthage in North Africa in 456, the See had remained vacant for fourteen years during the calamitous persecutions by the Arian Vandals which had driven his predecessor, St. Quodvultdeus (19th February) into exile. St. Deogratius best remembered for ransoming Christian prisoners of the Arians with funds he raised by selling all his and the Church’s possessions. St. Deogratius was already advanced in years when he was placed in charge of the See, and the strains of his pastoral work led to his repose in 457, after only one year as bishop. EPAPHRODITUS, (First Century), believed to have been the first Bishop of Terracina (about 56 km / 35 mi south of Rome on the Via Appia). He may have been one of the Seventy Apostles and mentioned by the Apostle Paul (29th June) in Philippians 2:25. FAILBHE, the brother of St. Finan of Rath (7th April), St. Failbhe was the immediate predecessor of St. Adamnán (23rd September) as Abbot of Iona. Nothing further is known of this saint. LEA, a wealthy Roman noblewoman who, upon being widowed, joined the community run by St. Marcella (31st January). There St. Lea spent the rest of her life serving the other members of the community. St. Lea reposed in 384. OCTAVIAN and COMPANIONS, several thousand martyrs at Carthage in North Africa, led by Octavian, an Archdeacon, under Arian Huneric, King of the Vandals (r. 477–484) in 484. PAUL of NARBONNE, though reliable details of St. Pauls life are not extant, there are two primary theories; the first, that St. Paul is the Sergius Paulus of Acts 13:7, converted by the Apostle Paul (29th June) who sent him to southern Gaul to preach the Gospel. The second is St. Paul was ordained in Rome and sent to Gaul where he had immense success as a missionary and served as the first Bishop of Narbonne. In both theories St. Paul is believed to have reposed circa 250. 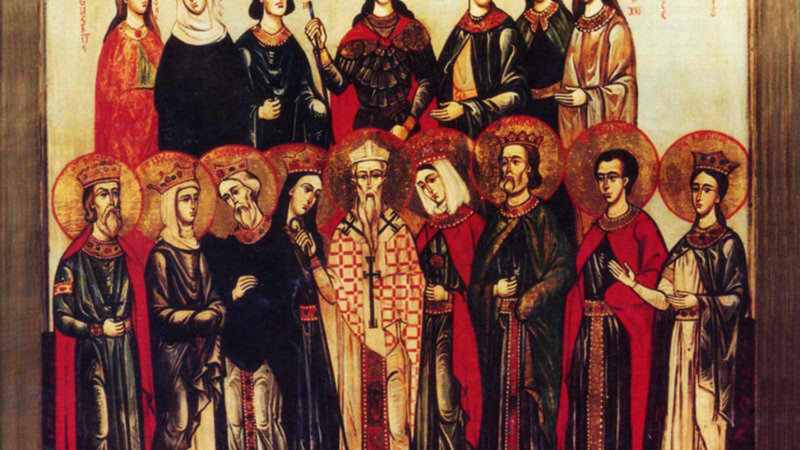 SATURNINUS and COMPANIONS, (Date Unknown), a group of ten martyrs in North Africa, although they are listed in all the ancient martyrologies, including St. Jerome's (30th September) Martyrologium Hieronymianum , there are no details of their lives extant. TRIEN (TRIENAN), (Fifth Century), a disciple of St. Patrick (17th March) he served as Abbot of Killega, and was a close friend of St. Mochta (19th August). There is no further information on this saint extant.